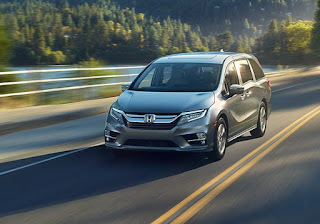 The 2018 Honda Odyssey has its own new features that continue to help set it apart from its competition. This model year, San Diego, CA drivers can enjoy CabinWatch and CabinTalk, as well as a new ten-speed transmission that really improves drive quality. CabinWatch and CabinTalk are the real innovations in this model, though, at least in terms of what the casual driver will most easily notice. The former allows the driver the view what’s going on in the back rows of the minivan without having to turn around. Cameras broadcast the image to the infotainment screen, which helps keep drivers’ eyes on the road even when the kids are acting up. And if those kids need to hear a stern warning from mom or dad, CabinTalk allows either parent up front to speak into a microphone that is broadcast to the back rows, eliminating the need to turn around make their voices heard. If you would like to check out these features in person, come pay a visit to your Hondadealership serving San Deigo, CA, and one of our Pacific Honda sales associates will be happy to get you behind the wheel. As always, the Honda Odyssey is a game-changer, and the 2018 model year version is no different.